Planning a celebration but fancy doing something different this festive season? Look no further than the Oast House! Discover a truly magical festive experience this Christmas at a king-sized Christmas Teepee in the Avenue Courtyard at one of the city centres’ most famous pubs. 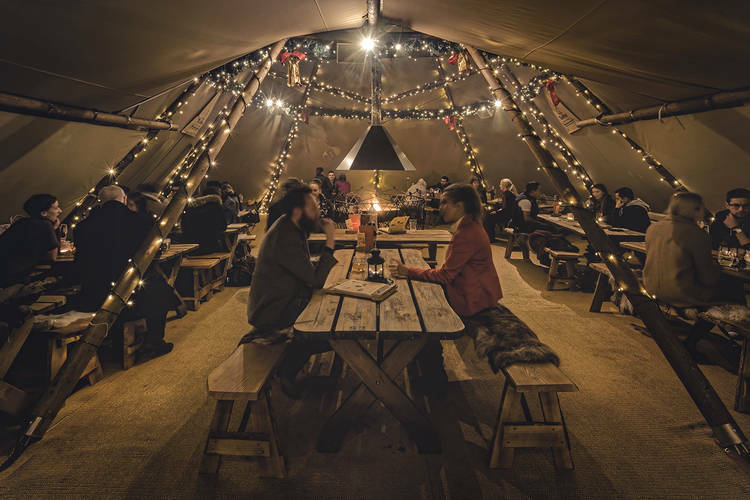 Working in harmony with the peaks of the award-winning Oast House pub, the Teepee will be decked in fairy lights, furs, blankets and wooden tables. A place to relax, tuck into a warming winter menu, or even host a private party. If you need some inspiration, then just for starters, a rare-breed hog roast will join the Oast’s delicious grilled meats and platters alongside a gourmet festive menu, made from the finest local ingredients. A Teepee party package with live music is available every Wednesday, Thursday and Friday and it is also available for private hire during November and December, subject to availability. If you’re looking for something a bit more casual, simply pop along to the Avenue Courtyard, outside the Oast House, for some informal Christmas cheer where each Thursday evening you’ll find roasted chestnuts, hot pot and Christmas carollers adding to the mix.